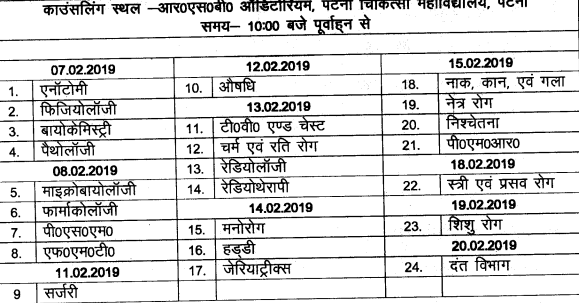 Bihar Health Department Recruitment Notification 2019 For 892 Assistant Professor Posts of Various Subjects is offered on 20.01.2019 at health.bih.nic.in and the Clear Details is mentioned on the Bihar Health Department Assistant Professor Recruitment Notification 2019. Applicants after referring them need to Fill and Submit the Online health.bih.nic.in Assistant Professor Application Form on or before 05th February 2019. 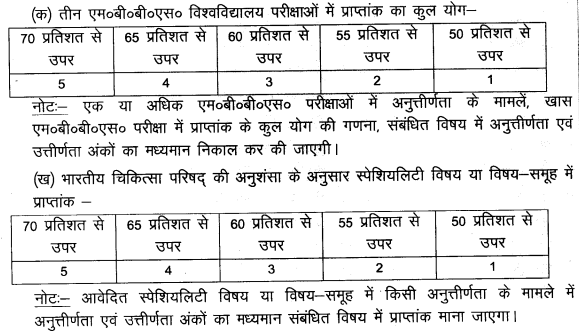 Bihar Health Department announced the Latest Bihar Health Department Recruitment 2019 For 892 Assistant Professor Jobs in Medical Colleges of Bihar And Health Facilities Department on Contractual Basis. For that Filling of the 892 Bihar Health Department, Asst Professor Job Openings Applications is being accepted from the MBBS Qualified Persons from Bihar State. So, the Applicants who come across this health.bih.nic.in Recruitment For Assistant Professor need to Scrutinise the Notification and if eligible need to Apply for the Bihar Health Department Recruitment of Assistant Professor in Online on or before 05.02.2019 and the Officials will arrange Counselling also on 07th to 20th February 2019 to hire the Candidates. For Furthermore details, the Aspirants need to stick on this page to get the updates about Bihar Health Dept Assistant Professor Recruitment 2019. Applicants must have the MBBS Degree in First Class from a Reputed Board to apply for the Bihar Health Department Recruitment Of Assistant Professor Jobs. As on 01.07.2018, the Aspirants must have the Maximum Age Limits as mentioned below. Contenders need to refer the Bihar Health Dept Assistant Professor Notification 2019 for knowing the Application Fee information. Bihar Health Department will hire the Candidates based on the Academic Merit List and Interview Only. Those who are selected will get Rs.70,000/- Per Month. The officials of Bihar Health Department broadcasted the latest Bihar Health Department Recruitment 2018 on their official site of www.health.bih.nic.in recruitment page for the reason, We provided the Bihar Health Dept Tutor Notification details for the eligible candidates. The eligibility criteria like education qualification, age limit, selection process, application fee, and salary details are clearly mentioned here. The Bihar Health Dept online application Starts from 07 to 14th Sep 2018. So, all the candidates should apply for this Bihar Health Department Tutor Application Form and grab this opportunity. Candidates should read the full article and gather the required details. Check the Bihar Health Department Sr. Resident Vacancy 2018 info from this page. Here we provide exact information without missing any details. The Bihar Health Dept board liberated a Bihar Health Department Notification for the reason of recruit the candidates for the Senior Resident & Tutor posts. That’s why we have given the Bihar Health Department Application Form at the end of the page. Candidates who are interested to apply through www.health.bih.nic.in recruitment page & they can apply before the last date is 14th Sep 2018. Contenders are you searching for the Tutor Recruitment those candidates keep in touch with our site @ Recruitmentindia.in for more details. Most of the applications are ready to fill the vacancies for the 1585 Sr. Resident / Tutor posts. So, all the eligible aspirants must and should check the Bihar Health Department Tutor Application Form details from our site. Applicants who want to apply this Bihar Health Department Tutor Notification they must check the vacancy details on this page. Because the Bihar Health Department Sr. Resident Vacancy details are important to all the aspirants who want to apply this Health Bihar Dept Recruitment. Some of the candidates get to struggle about the Bihar Health Department Notification from other sites due to rush in getting the links for those excited candidates we can give the education qualification and age limit on this page. The education qualification for Bihar Health Department Sr. Resident / Tutor Posts is having the Post Graduation in a relevant discipline. The maximum age limit is required for this vacancy is 37 Years. Candidates are you want to download the Admit Card then click the highlighted one. Qualification Details For Resident / Tutor Post: Passed Post Graduation in a relevant discipline. Further Details of Qualification Information Please Check The official notification Below. Candidates can check for the application fee from official notification. The application free is divided all the candidates based on category wise. Candidates can refer to the official notification and gather the pay scale information. Contenders, are you still searching for the Bihar Health Department Recruitment 2018? then you can check our site and gather the necessary details. Most of the candidates are waiting for this Bihar Health Department 2018 Notification those candidates can refer the information from www.health.bih.nic.in recruitment page and applied for this Bihar Health Department Tutor Online form which is available in this page. Here we also provided the Health Bihar eligibility in stepwise. Some of the aspirants don’t know how to apply for those candidates we can present step to step in simplified format in order to get east way while filling the application form on our site. Candidates can click on the given application link and start filling the details. if they ask their documents then you can attach and then make a payment and submit those details. For Bihar Health Department Sr. Resident Vacancy applied candidates, we can furnish the Previous Papers here. Aspirants can check the Bihar health department Senior Resident 2018 notification with the application starting & ending dates here. Because all the candidates who want to participate in the Bihar Health Department Recruitment 2018 Process they can apply before the date expires. The active Bihar Health Department Tutor Application Form links are provided on this page. Here the official mention in the notification candidates who are applied for this Bihar Health Department Sr. Resident Vacancy they can be selected on the basis of their performance in the written test only. So, you can download the Syllabus and prepare then you can definitely get a job.